July weather – weather since spring, really – has taken the top end off of US corn yield potential, and now the only issue is of degree. The graphic below displays the average July temperature across the principle Corn Belt, and 2017 looks to be the warmest summer since 2012. 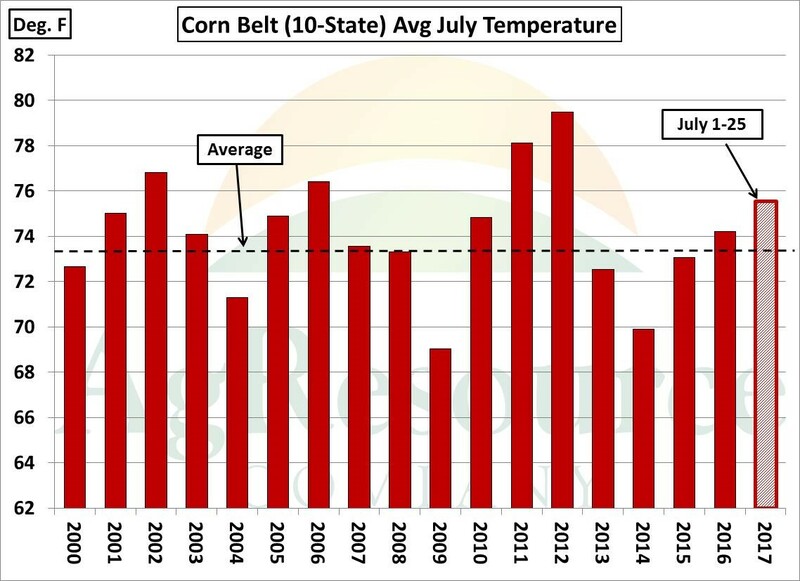 This year’s heat wave does not compare to those of 2011 and 2012, but July temps have been similar to 2010, and our work – along with the recent trend in crop ratings – suggests there’s potential for a major downward revision to national US corn yield in the Aug and/or Sep NASS reports. We further mention that, unlike 2010, this year’s growing season has been much, much drier across the Plains, as well as much drier in IA, MO and southern IL. 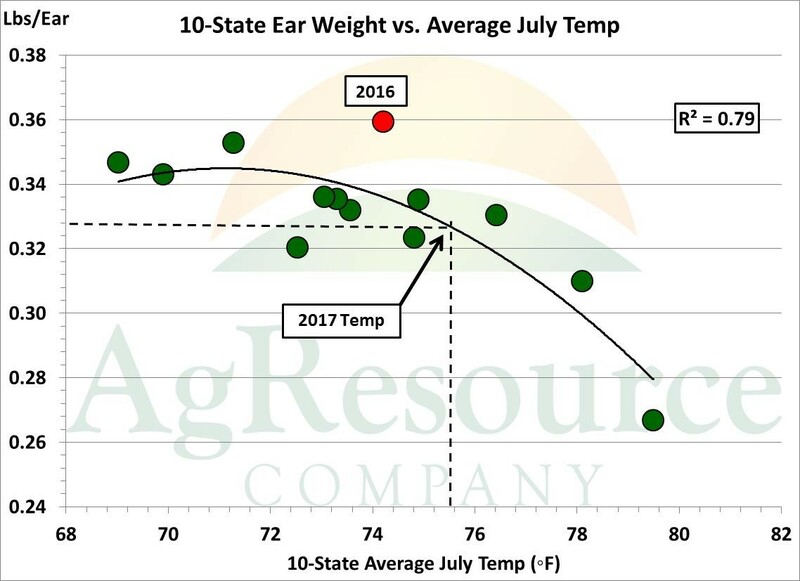 The correlation between July temps and the 10-state ear weight is below. 2016 is somewhat of an anomaly, and whether this anomaly will be repeated will be critical to price direction in the next 60 days. This model still has a nice fit, however, and assuming this year’s July Corn Belt temp (75.6, vs. 74 last year), the 10-state ear weight should be no heavier than .326-.330#.Crop conditions also tell a better than story than some realize, and despite some modest heat last year, crop conditions stayed perched near record highs at 74-76% GD/EX through August. That is not the case this year. The table above displays national US yield forecast using various ear weight scenarios. Plant populations and ear counts are assumed to be slightly higher than last year, but using any ear weight other than 2016’s record results in a US corn yield below 166 Bu/Acre. AgResource today leans toward a national yield in a range of 162-165 Bu/Acre. This still does not imply a runaway bull market – old crop global stocks are record large, as is South America’s surplus – but this does strip some 700-800 Mil Bu off US corn supply, which would put 17/18 stocks at 1.7-1.8 Bil Bu. This, in turn, puts fair value at $3.60-4.10, basis spot, through end of autumn.